Head over to the Journal to read the inaugural post, wherein I give thanks to the many people who have helped me out along the way. I’ve had a lot of fun getting the site set up, playing around with some cool new technology, and discussing the design and content with various folks. For our long-time readers here at World Wide Wood, don’t worry – nothing is changing on this site! You’ll still be able to find all of the photos of me, Rebecca, and Catherine, as well as photos from all of our adventures with family and friends. But please do check out at Peter R. Wood Photography, where I will discuss photographic subjects in greater depth, as well as show off some of my best photos. This doesn’t mean that I’m quitting my day job; rather, I’m simply devoting more time towards my favorite hobby. So, if you’re in the Boston area and in need of some photo shooting and/or training, please keep Peter R. Wood Photography in mind! And be sure to follow the Journal for photo news, tips, and insights. This entry was posted in Photography on April 29, 2008 by Peter. Today was the first big day of work on our project to turn the basement into a habitable space. For now, you can take a look at the photos from day one! 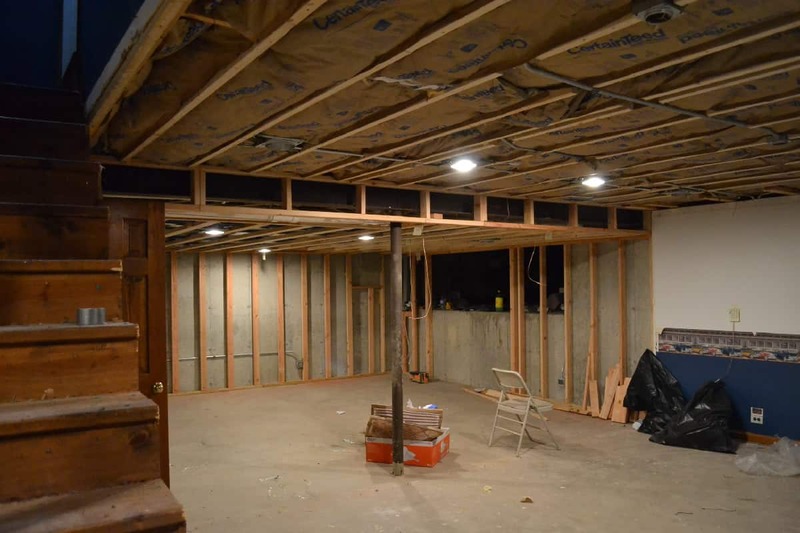 The overall plan is to turn half of the basement into a living room, while the other half will be used for storage and laundry. Ken and Dianne came over, and while Dianne watched Catherine, Ken led the way in starting to make the downstairs take shape. The first order of business was to remove a wall that formed a large closet downstairs, so that we could create a larger living room space. Next, we prepared the joists so that we could attach the new walls. Finally, we framed up the new walls that would separate the living room area. We also purchased a set of doors and temporarily put them in place to see how they’d look, we will install doors made of steel to see if they look better. All in all, a big day of work, and we got a lot accomplished! We’ll probably have one more day to frame one more small wall and take care of a few other outstanding roughing issues. Then there will be some electrical and plumbing work with a good company or as easy as to and then we’ll get our rough inspection from the town. After that inspection, we can put up drywall on the ceiling and walls, finish things off, and then have the finish inspection. Then we can start moving things in! We’ll keep you posted here with news and photos as things progress. This entry was posted in House on April 26, 2008 by Peter. Today was a simply gorgeous day, so we headed to Dane Street Beach in Beverly for dinner and some playtime. Catherine had a blast on the beach! We’re really looking forward to summer time and more trips to various beaches in the area! You can see more pics from today here. This entry was posted in Catherine, Family, Photography on April 23, 2008 by Peter. Today I headed in to Boston to meet up with 20 or so other photographers to take in some Historic Churches of Boston. I had a terrific time, walking around Boston all day, photographing churches (and other things), and talking to other photography-minded people. There were an overwhelming number of Nikon DSLR shooters there, which was quite surprising. I expected it to be fairly even, but everywhere I looked I saw the telltale black-and-yellow straps! Talk about branding! I met some terrific people, and got to see how others used their cameras. I also doled out a few helpings of advice, particularly to people with compact cameras. Those little things are pretty powerful once you get beyond ‘Auto’ mode! I’m really looking forward to seeing the photos everyone came away with, particularly where we were all taking photos of the same things. Should be interesting to see some different perspectives. As I mentioned to a few of you, I am working on my own dedicated photography website. Stay tuned to this website for more details on that. Hopefully it will be launching soon! Last but not least, here is a link to the photos I took during the course of the day! If you were at the meetup, please leave me a comment and say hello! Also if you’ve got a website, feel free to share it here. I hope to attend another one of these meetups and see some of you folks again! This entry was posted in Photography on April 19, 2008 by Peter. I’m glad that Catherine and Rebecca made it home safely from their trip to Ohio. The house was pretty lonely without them. In celebration, I’ve put up a gallery of some of my favorite photos that I’ve taken of my favorite photographic subject since her return. Enjoy! This entry was posted in Catherine, Family, Photography, Travel on April 15, 2008 by Peter. I (heart) my new towel rack. Our towel shelf in the bathroom has always been a bit of a disaster. I can’t get one towel down without pulling down all the others as well. I can never fold the towels so they look nice and it has bothered me right from the start. I’ve always loved the towel racks I’ve seen at various hotels. They hold the towels so neatly and there’s never any risk of toppling the pile when you only want one. For years I thought these fantastic racks were found only in hotels. Now I have one of my very own. Who’d’ve thought I’d find one at the Beverly Bootstraps Thrift Shop? This entry was posted in House on April 13, 2008 by Rebecca. By holding the camera facing backwards and aiming ‘blind’, I was able to capture some photos in the car during our trip last week. I think they tell a great story of our adventure. This entry was posted in Catherine, Travel on April 13, 2008 by Rebecca. Friday morning saw Catherine and I packing up, eating breakfast and saying our goodbyes to Kirsten and Mark. We hopped in the car and proceeded to shuffle off to Buffalo. The rain stayed with us the whole trip, but we enjoyed the tap, tap, tap that it played on the roof. This entry was posted in Friends, Travel on April 6, 2008 by Rebecca. We were happy to get to celebrate Kirsten’s birthday with her. She sure enjoyed that cake! This entry was posted in Family, Travel on April 6, 2008 by Rebecca. I had the opportunity to visit my lovely friend Heather today while Catherine had some quality time with Grandma. Heather and I had a little knitting lesson, became engrossed in some philosophical discussions about life, drank some tea, ate lunch at Biddie’s and visited some giant ears of corn. Not necessarily in that order. This entry was posted in Friends, Travel on April 2, 2008 by Rebecca.